Ken Schwencke filed this request with the Tigard Police Department of Tigard, OR. I would like the records in a machine-readable, electronic format if possible. If the records are kept in another format, or kept individually, I would still like copies. This request is made as part of the Documenting Hate Project, a collaboration involving dozens of news organizations, led by ProPublica. Coverage from the project is compiled at https://projects.propublica.org/graphics/hatecrimes#hatecrime-coverage. 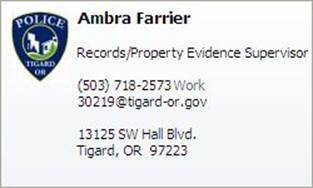 Our agency has received your request for information on bias crimes since 2010 in the City of Tigard. As it happens we already have such a report that has been compiled with the information requested, that just required updating with the most recent information. Due to the fact that this request did not require numerous hours of staff time for research and compilation, this report can be obtained from the Police Department after a fee of $10 is received by our agency. This fee may be paid in person by cash, check or credit card or by mail in a check or money order with your written request to Tigard Police Department, 13125 SW Hall Blvd., Tigard, OR 97223; attn. A. Farrier. Once the fee is received, the report can be emailed to you as an attachment. If you have any further questions, please contact our police records department at 503-639-6168. DISCLAIMER: E-mails sent or received by City of Tigard employees are subject to public record laws. If requested, e-mail may be disclosed to another party unless exempt from disclosure under Oregon Public Records Law. E-mails are retained by the City of Tigard in compliance with the Oregon Administrative Rules "City General Records Retention Schedule." Thanks, Ambra. A check should be on its way. Appreciate the help. Please find enclosed a check for $10.00 to satisfy the fee associated with the attached public records request. Our agency has received payment for requested report. Please see report attached.